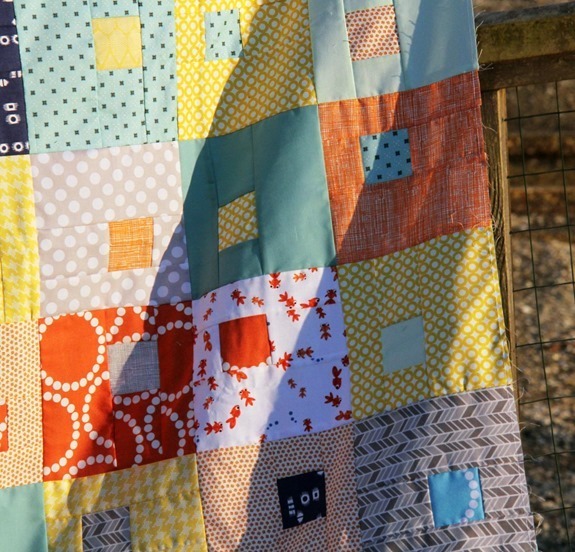 This quilt top has been sitting on a shelf waiting for me to take a picture of it for a few weeks, until tonight when I stuffed my kids in the car…determined to take a semi-decent picture of it before dark! 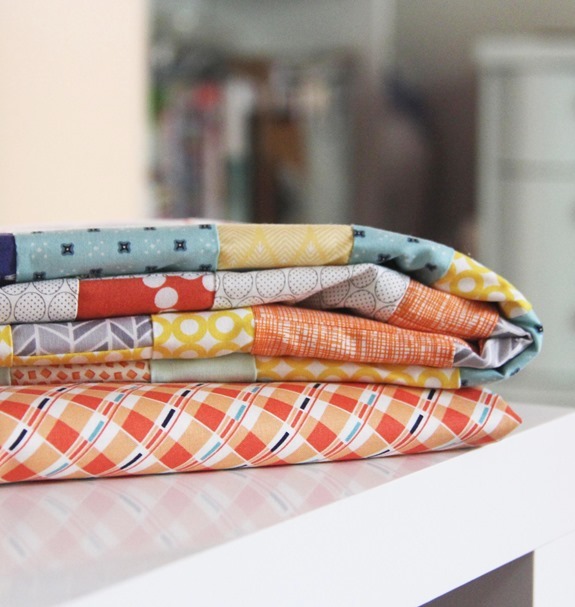 I chose the fabrics based on that Goldfish Print (it’s by Timeless Treasures). The pattern is Juice Boxes. I realized after making it that it looks almost exactly like the cover quilt I made 3 years ago. This is the crib size and it measures 42″ x 54″. Now that school has started I’m finally getting back into the swing of things. …I tried not to act “too” excited when I dropped him off the first day. ;) But we miss him when he’s gone. Yay for schedules, colder (sewing) weather, and pumpkin everything coming soon! Really lovely colours. Enjoy the serenity. do like the random way the blocks have been placed and the fabrics used. Must be hard finding time to sew with little ones, I am now elderly and live alone so my time is my own, can be lonely at times but have lots of bloge to follow. What a great looking quilt. The little squares in different places makes me think of the screen saver on the tele that shows the logo in a different place each few seconds. It's beautiful – and reflects the light you took your picture in – it seems an evening and autumn quilts to me! Love the colors! The picture looks terrific despite a few little wrinkles. Sweet top, Allison! I love the colours… And the simple design. Great job! I love your quilt top, and the fact that it still has crinkles makes it feel even more "homey" than if it was wrinkle free! Too cute! Both the quilt AND the toothless smiley kid! The quilt is perfection! Love it's simplicity and colors! naww, that's not at all what I was thinking. But, since you brought it up. I do need a new iron and , once I got over the price… I paid quite a bit less for my old one. I have not been able to find an iron that doesn't have the auto shut off. What do you use and do you have any suggestions – does yours try your patience with the auto shut off ? When my oldest went off to school full time the other two had a big adjustment 'cuz she was the leader/tattletale ! 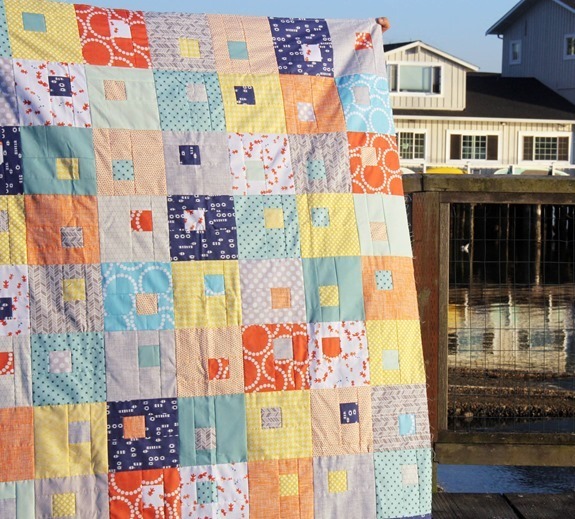 Love this quilt (especially those goldfish)! I also like the softness of some of the colors mixed with the boldness of the navy and orange. Lovely quilt. My son is home from university at the moment and I don't seem to be getting anything done, but I would'nt miss having him home for the world. 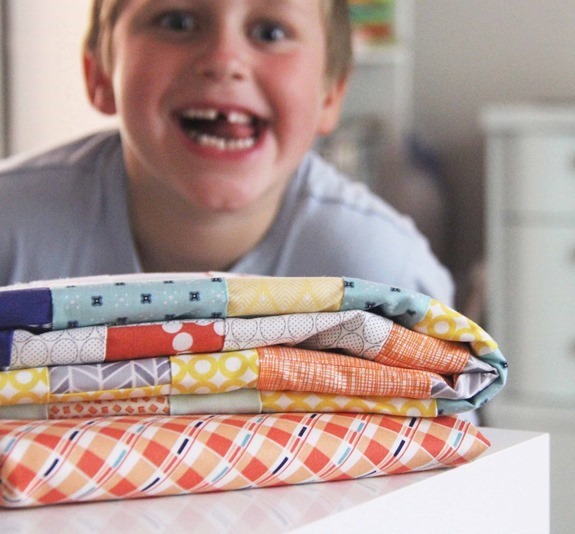 That is a cute quilt top! Hmmm I can totally relate to you. I was excited too when my 6yrs olds school started ;). Now me and the little one 2yrs old can have some peaceful mornings! We still miss her though. Love the quilt top Allison!! So cute :) It has been a little quieter around our place as well with school, gotta love it. And yippee for pumpkin! Love this quilt. Makes me want to head to the sewing room. Lovely!! Those goldfish are adorable. And I'm so with you, I'm so ready for fall. Even though my kids aren't in school yet, it's such a wonderful time of year! When my youngest began full day school I was not so secretly delighted too, but I surprised myself by crying in the car over it one day too…its a change like everything else, even if its all great! I love the Goldfish! LOL loved the last pic! What a wonderful quilt! The fabric/color choices are perfect! 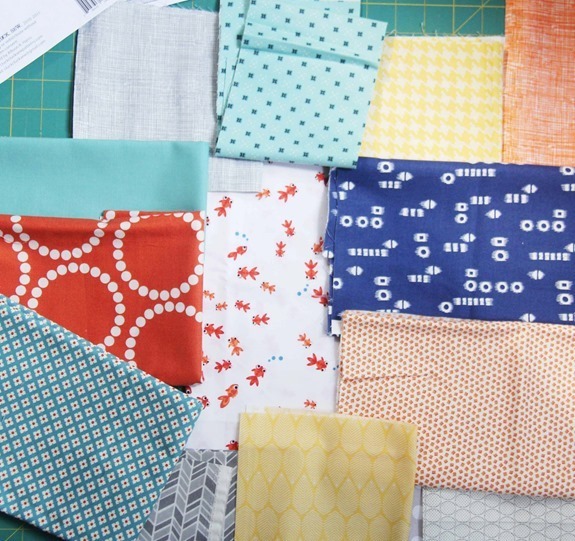 What is the name of the fabric that looks like it's going to be the back (the orange and blue plaid looking one)? Love the colors! Allison, I discovered your blog from reading Melissa Bo's Book Reviews and Quilts interview with you. I'm having a ball looking at all your beautiful projects. I love the last sentence of this post: "Yay for schedules, colder (sewing) weather, and pumpkin everything coming soon!"